He might have added that the school master’s performances are not merely twice nightly, like that of other variety artists, but four or five times daily; and that many of the interludes are occupied with even more varied performances in spheres other than the form-room. Very Old Boys have many of the characteristics of Very Ancient Mariners, but they seldom have either the eloquence or the glittering eye that can stay the passing reader with pictures of the academic life of a school of their day; but it may be of some interest to try to recall some of the actors in the form-rooms of King’s at the beginning of the century. Owing to the fact that I deserted the Classics for two years for the adventures of Science my experiences in school with the Headmaster – then Mr. Galpin – were limited to his lessons in Greek Syntax with the Fifth Forms. These were taken in the Parry Library, and each week we had to be word-perfect in some three or four pages of Thompson’s text-book. Galpin would come in on the stroke of the clock with a dignified but brisk purposefulness and glance rapidly round the silent and apprehensive form with what had every appearance of an excess of benevolence, as if he were welcoming us all to a party. This deceptive appearance was reinforced by his habit of rubbing his hands together with what we knew in fact to be a malicious glee. There was no introductory nonsense; a few questions to be written, and then the real business of the day. He began his questioning in much the same way as that in which Trollope’s Mr. Chaffanbrass might begin his cross-examination of a trembling witness, with a sort of oleaginous helpfulness which was designed to destroy the morale of his victims and lead them to total confusion. Mr. Galpin and Mr. Thompson had, we were frequently told, been colleagues at Marlborough. Mr. Thompson, we were as frequently assured, was an excellent scholar; His text-book was the best yet written; but the impression we gained was that, like Wordsworth’s “Excursion”, it would never do. It seemed unfair that I should be asked to arbitrate between these two old friends in their own field of classical scholarship; but it would obviously make things more comfortable all round if I gave an affirmative answer, and it was possible that an enthusiastic affirmation of my belief in his superior erudition might even dispel the glint of malice from the smile with which he was awaiting my answer. Galpin was above all things efficient. Whatever he set out to do he did. He set out to teach us Greek Syntax, and somehow in these paralysing periods he came as near to achieving his object as is humanly possible. My first form was, I think, called Upper IVA, but form nomenclature differs so widely in different schools and changes so rapidly at King’s that I really don’t remember and it certainly does not matter. Its headquarters were on the ground floor of the Parry building at the School House end; and it was presided, rather than ruled, over by a young classical master, J. M. Edmonds, who was an easy-going form-master with an impish sense of humour. Our main bill of fare consisted of Virgil and Horace, chiefly memorable because we had to learn by heart some twenty lines of the first and rather more of Horace each week. One of the very occasional highlights in this form was the singing of Horace’s Odes to tunes which fitted all the intricacies of Horatian prosody. Sometimes this performance took place in Edmonds’ own room in the School House, where he was Tutor, and on rare occasions in the form-room, where there happened to be a piano. Although this musical interlude seemed to give every opportunity for this easy-going form to stage a riot, it never did so. Above us in the Library, Jerry Guest would probably be in the middle of a complicated mathematical problem with the Army Class, and therefore we sang the more vigorously and at tremendous speed so that we might have as much of the fun as possible before an emissary might arrive from the Army Class with a mild and courteous translation of Jerry’s unutterable protest. In fact I believe that this was the primary object of the operation. Another curious feature of this form was the system of marking by places. Edmonds could not be bothered with written tests, and all learning work was tested by oral questioning. If, say, No. 5 was asked a question and failed to answer it and it was finally answered by No. 10, then No. 10 took the place of No. 5 and all who had failed to answer the question moved down one. This made such lessons extremely exciting, and by the end of my first year I had acquired a useful technique for the game. I learnt the latter part of the lesson very thoroughly and thought out all the possible supplementary and unexpected questions – for Edmonds was an unexpected sort of man – rather as the cross-word expert studies the modes of thought in those who set such things. I would slide gently down the form to somewhere near the bottom and then wait anxiously for one of my “specials”. With the best luck one of those would start with No. 1, and there would then be the chance of the question arriving untouched, after the most excruciating suspense, at my lowly position. I could then take my place as No. 1, and again with more luck that would be the end of the period and I would get top marks. How Edmonds correlated these haphazard and unfair estimates with the marks for the written exercises is not known, but the result was that large slabs of the form were always bracketed equal in the weekly orders; and we were always waiting for the final assembly of the term – when the Headmaster read out the end-of-term orders and promotions – and hoping to see Galpin rub his hands and hear him gleefully announce: “Upper IVA. The whole form bracketed equal, 1st”. But well or ill, England, we died for you. These were written·over the initials J.M.E. But I remember Edmonds as my first form­master who infected his form with something of his easy-going courtesy and something, too, of his impish humour, who taught us to work hard, but how not to take it all too seriously. If variety be the spice of life then the move from Edmonds’ form to that of the Reverend L.G.H. Mason, commonly known as Tar, was a great deal too spicy for me. Tar was an O.K.S. who had returned to the School as a master exactly thirty years before, and was now distinguished by a large paunch, heavy-bearded jowls, raul-drill eyes, and a gown that was green with age and wear. There were a few who could “take” him and may even have regarded his form-room appearances with some kind of dismal amusement. The oldest inhabitant of the form in my time could cat-sleep through the most terrifying periods and wake up at the appropriate moments to supply one of Tar’s favourite phrases from Conington’s Virgil, or to laugh at one of his biting witticisms directed at the trembling translator of the moment or at the notes and comments of the scholarly and majestic editor of Horace, T. E. Page, whom for some reason he held in special contempt and whom, for some still odder reason, he called the Gadfly. Some, no doubt, revered Tar for his scholarship and may have learnt much from him; but for most of us the year i n his form was a year of terror. I tried to reduce this time by working at all my written work for him as I have never worked before or since, but as everyone did the same my efforts were unsuccessful. A description of these performances would require a style compounded of Dante and Peter Cheyney; and I prefer to pass to one whose memory should really be embalmed in the leisurely calm of the prose of Walter Pater. When I was in Tar’s form I escaped his Latin and Greek Verse work by nibbling at Science, and at the end of the year I went over to the Science Side altogether. But I was officially in the Reverend L.H. Evans’ form and worked with it for some periods, and of these I remember best those afternoon periods in the winter when he used to read to us some of his favourite passages from English poetry. Evans always looked and spoke as if he were just falling asleep, and for that reason, I suppose, he was universally known as Winks; in fact he also looked and spoke as if he were about to dissolve in tears. It seems strange now that his drowsy and lachrymose rendering of poetry should give us so much pleasure. His taste was Victorian, not unnaturally, since Queen Victoria had been dead less than two years; and I remember his reading the most Victorian of Tennyson’s poems, as Aylmer’s Field and The Holy Grail, though the poem that has always stayed with me was by Tennyson in another mood, Lucretius. Winks used to help me, too, in my struggles with Browning. He may have read to us in the summer too, but if he did, we must have fallen victims to his drowsy voice and the poems must have fallen into oblivion as he read them. mutine, mutiny. See Ben Jonson’s Sejanus, iii, i: ‘Had but thy legions there rebelled or mutined’. The verb ‘mutine’ does not occur elsewhere in Shakespeare. We have, however, ‘mutine’ as a substantive, Hamlet, v. ii. 6. Cotgrave gives ‘Mutiner, to mutine; Mutinateur, a mutiner’, i.e. mutineer. This form ‘mutiner’ occurs in Coriolanus, i. i. 254, but in Tempest, iii. ii. 41, the Folio has ‘mutineere’. And that is just where Winks ought to be. 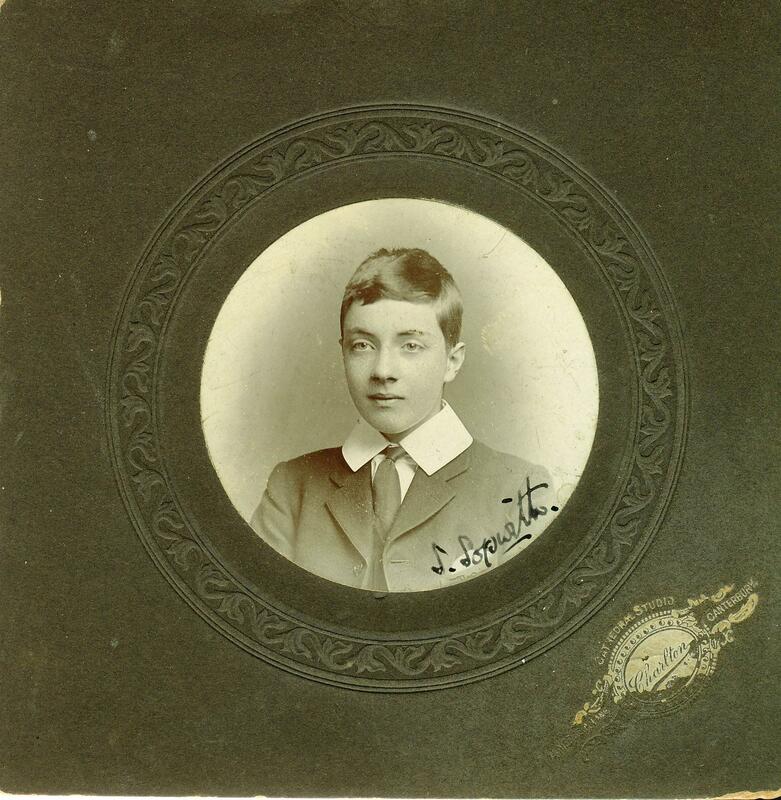 Sydney Sopwith (1901-05) went to Emmanuel College, Cambridge. After spells teaching at the Lycée de Poitiers and Northampton School, he taught at Shrewsbury School from 1915. 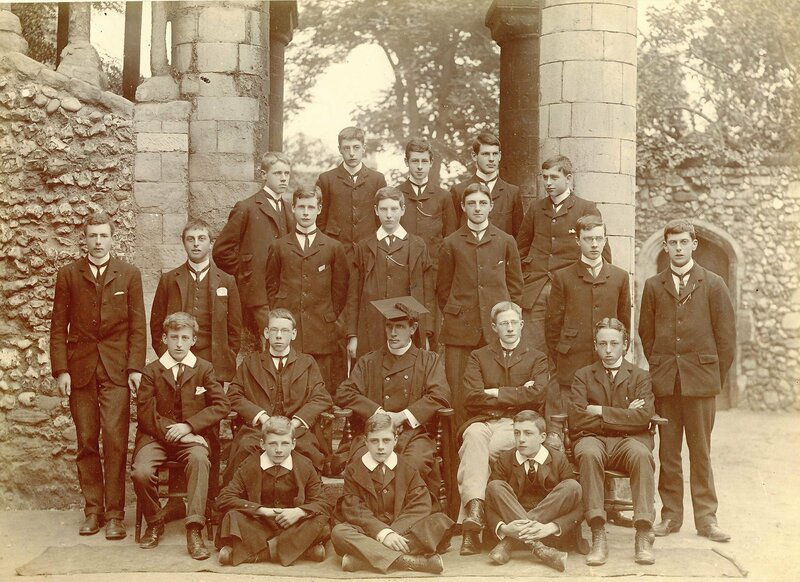 On his retirement in 1948 he was brought to King’s by John Shirley and became the first housemaster of Galpin’s. He finally retired in 1967, aged 80, and died in 1974. These reminiscences were published in The Cantuarian, April 1956, pp. 394-97.